Face ID 4, the all-new powerful facial recognition terminal from FingerTec provides solid identity verification through contactless biometrics technology, recognizing a face in mere seconds for accurate attendance reporting. Loaded with Face VX 8.0, the latest of face recognition algorithm, detecting facial features during enrollment and verification is made quicker and more accurate, and with the high-resolution camera and infrared feature, face detection is possible even under minimal light. 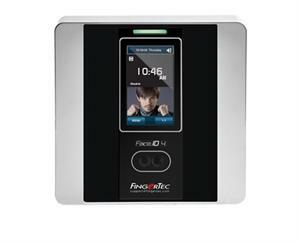 The Face ID 4 is designed excellently to position your face for easy recognition, suitable for small and medium enterprises which are looking for hassle-free, sophisticated system. Contactless Identification - With the Face ID 4, all you need is one look, and you’re ready to go. Facial recognition makes it easy for you to verify yourself without having to free your hands. Easy Communication Methods - Sync the Face ID 4 with a PC using one of these easy-to-use communication methods: TCP/IP or USB flash disk. Get Your Extra Features Here - Full color touch screen, short messaging, work codes, photo display after verification. These are among the many additional features that you get with the Face ID 4. Revolutionary Face Technology - With the latest VX8.0 face recognition algorithm, face detection during verification and enrollment is now quicker and more accurate. Ergonomically Designed - The Face ID 4 design is engineered specifically to facilitate easy positioning and alignment of your face for an easy and hassle-less verification. Value for Money - The Face ID4 was designed to be economical so that you are able to implement FingerTec solutions at a lower cost. We believe that when it comes to business and security, there should be no compromise. Manage Your Data Easily - Administration is easy with the bundled software. FingerTec's TCMS allows you to generate reports, monitor attendance and integrate FingerTec with a third party system.